The Elk Grove City Council approved the expenditure of $150,000 to erect two event advertising signs at their regular meeting on Wednesday, March 9. The two signs will be constructed at high-traffic locations on westbound Laguna Boulevard before West Stockton Boulevard and the southeast corner of Big Horn and Elk Grove boulevards. The non-electronic, non-illuminated signs will be used to advertise community events sponsored by the City as well as those from various community organizations. Although the City Council deferred a final decision on how the signs would be managed, during public comment John Broughton, Chairman of the Elk Grove Chamber of Commerce, said his organization was well-suited to administer the program. "We are in the business of promoting, promoting businesses, promoting events," Broughton said. "This is our core business, and we think a partnership with the City is a logical one for us." Although the City Council indicated unanimous support to fund the program into the City's budget for the next fiscal year, one member expressed some skepticism over the need for the expenditure. 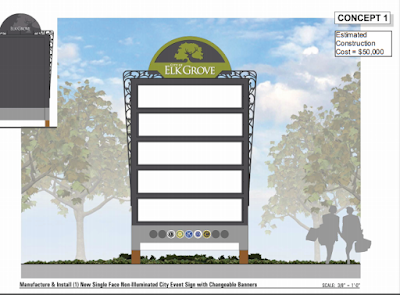 Council Member Pat Hume said he was pleased the City decided not to pursue the 10 electronic dynamic message that would have cost almost $500,000 that former Mayor Gary Davis had proposed as part of his push to transform Elk Grove into a major tourist destination. Hume, who opposed the 2013 proposal, said he was not sure there was a need for these signs. "The most positive thing I can say about this is that we at least have moved away from the idea of electronic reader board signs," Hume said. Hume went on to say he felt the $150,000 expenditure would have a "negligible impact" given it would only reach people who use these routes on their daily commute. Additionally, Hume said the individual groups within the City that hold events which might use these signs already have a network of followers and connections through various social media and other means. "This seems to me a 19th-century solution to a 21st century going forward," he said. Another boondoggle for EG residents and taxpayers. People use smartphones and GPS to find their way around these days. Besides, those travelling at 55-60 mph down EG Blvd and Laguna/Bond won't see it. Wayfinding signs are superfluous and only serve to highlight the City's lack of identity and desire to appear more like other towns that have these existing signs. What this town really needs and lacks is a BOOK STORE since Borders has closed shop.